Halloween Eye Safety: Watch Out For Decorative Lenses! Home » What's New » Halloween Eye Safety: Watch Out For Decorative Lenses! With the autumn comes Halloween and with that, costumes. As a consumer, you want to know of some dangers to your eyes and vision that could come along with the fun and games. Over the past few years, decorative contacts have been increasingly becoming popular particularly with teenagers and young adults and the trend is alarming eye care professionals. Contact lenses are a governmentally regulated medical device. It is illegal to sell contact lenses without a license which is the case with most outlets where costumes and party goods are sold, however obviously the regulations are often ignored. Lens manufacturers operating outside of regulations may use inferior plastics or even dangerous dyes to dye the lenses. Additionally, use of contacts without proper fitting and treatment, can cause critical eye injury or even vision loss. For those who do decide to wear special-effect lenses, it is essential to make an exam appointment with a licensed eye care professional. After a comprehensive eye exam, the optometrist will determine the correct size, curvature and if needed prescription required for the contacts. The eye doctor will also provide necessary instructions on how to properly insert, remove and care for contacts. Although many individuals incorrectly consider decorative lenses as just another cosmetic item, improper use of contacts can result in significant danger to your eyes and vision. No item should ever be applied into the eye without proper professional consultation. 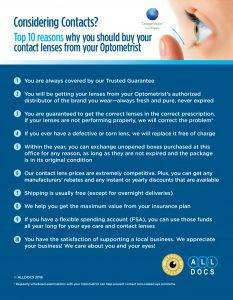 Only buy contact lenses from a licensed seller that you can guarantee comply with all FDA regulations. Even non-corrective lenses must adhere to health regulations and need a prescription. Beware of e-commerce sites, flea markets or beauty supply stores that may sell unregulated products colored with unapproved materials. To determine if the store is authorized to sell contact lenses request the state license number and follow up with the Department of Professional Regulations (DPR) of the home state. If your disguise just won't be complete without special effect contact lenses, call your trusted optical store before making any purchase. Halloween shouldn't be a "frightful" night for your eyes. Be aware of the dangers unregulated use of lenses can be to your eyes.